The 2015 NFL Draft is finally here and the first round is tonight at 5 p.m. PDT on ESPN and the NFL Network. 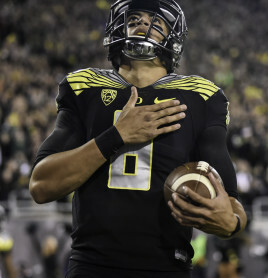 At last, Duck fans will know where Marcus Mariota will start his NFL career. Among critics, Mariota is considered the first- or second-best quarterback – depending on whom you ask — and will likely be a top-5 overall pick. Mariota has two knocks against him. He played with a spread offense in college where he may have trouble transitioning to an NFL system because of his lack of read progression. 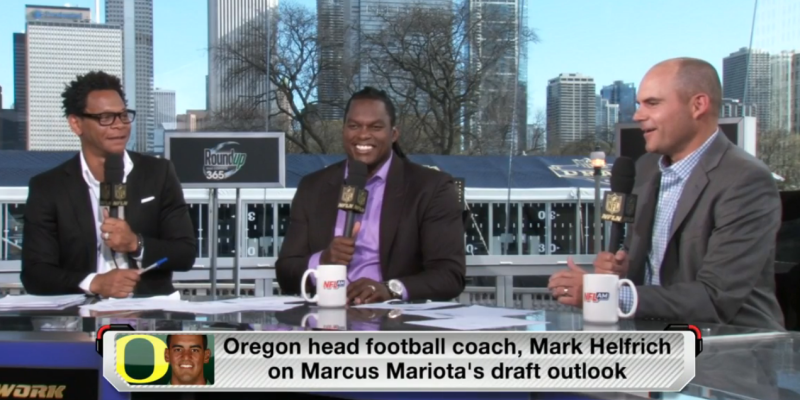 However, on NFL Network’s morning show yesterday – NFL AM – Oregon head coach, Mark Helfrich, spoke about his offense and his former quarterback’s ability to go through progressions. Against college opponents, Mariota can consistently get away with minor flaws in his technique, but in the NFL, he will need better footwork in order to succeed. However, improving footwork is something that any player with the great work ethic and dedication to the game Mariota has shown, can achieve with proper coaching — so he will improve. Three chest pounds and a point for Marcus Mariota. Some critics associate Mariota’s quietness as a flaw while Jameis Winston – the favorite to be the first overall pick — is loud and engaging. Well, that’s because both quarterbacks are products of their upbringing. Helfrich stated that, “In his culture, that’s not what you do. You don’t show up on Day 1 and tell other people what to do. You show up and you work.” Then added, “He just got a little more vocal every year, almost every single day, by developing the confidence, getting out of his shell.” Mariota learned to be leader in college, so whoever thinks he can’t do the same in the NFL will be proven wrong. For all you did for your university and community – thank you, Marcus Mariota.